As a specialist in data visualization, essentially I strive to help people think and communicate more effectively. Consequently, I am always on the lookout for new insights into how we think and how thinking can be improved. For example, my library of books about critical thinking is quite large and always growing. In the last month or so, I have read two wonderful books about thinking and the brain that have now taken prominent positions in my library: The Accidental Mind, by David J. Linden, and Don’t Believe Everything You Think, by Thomas Kida. Brain research is one of the most exciting fields today. What we know about the brain is increasing at a rapid rate, partly due to technologies such as fMRI’s (Functional Magnetic Resonance Imaging), which now make it possible to observe what goes on in our heads to a far greater degree than ever before. I purchased a copy of this book, in part because I wanted to better understand how neurons chemically and electrically form thoughts and store memories. As a Professor of Neuroscience at the Johns Hopkins University School of Medicine, Linden is qualified to explain this, and he is able to do so in a way that doesn’t require a medical degree to understand. You’ve probably seen it before: a human brain dramatically lit from the side, the camera circling it like a helicopter shot of Stonehenge and a modulated baritone voice exalting the brain’s elegant design in reverent tones. To which this book says: Pure nonsense. 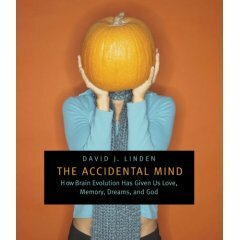 In a work at once deeply learned and wonderfully accessible, the neuroscientist David Linden counters the widespread assumption that the brain is a paragon of design—and in its place gives us a compelling explanation of how the brain’s serendipitous evolution has resulted in nothing short of our humanity. A guide to the strange and often illogical world of neural function, The Accidental Mind shows how the brain is not an optimized, general-purpose problem-solving machine, but rather a weird agglomeration of ad-hoc solutions that have been piled on through millions of years of evolutionary history…With forays into evolutionary biology, this analysis of mental function answers some of our most common questions about how we’ve come to be who we are. As a meta-thinker—someone who thinks about thinking—I am all too familiar with the foibles of the human brain. Contrary to what’s commonly assumed, the brain is hardly the product of intelligent design. It would be extraordinarily difficult for anyone who is familiar with the brain to fail to see it as a strong argument for Darwinian evolution. Although Linden does not deal with data visualization, what he reveals about visual perception, learning, and memory provides important background that is useful to anyone who wishes to develop expertise in this field. A skeptic is just a person who wants to see and evaluate the evidence before believing. In its truest sense, a skeptic is someone who keeps an open mind, but requires rigorous investigation before choosing to believe something. We rarely appreciate the role of chance and coincidence in life. We can misperceive our world. He explores each of these problems in detail, blending findings of science and anecdotes from personal experience together in a highly readable way to help us recognize these problems when they occur, understand what causes them, and work around them to produce the clear thinking that can result in better decisions. Unlike many treatises on critical thinking, this book is infused with compassion. It acknowleges that we all make these mistakes, and that we don’t make them because we’re stupid. Rather, we make them because we’re human. Kida doesn’t berates us for making these natural mistakes, but rather leads us gently to practical solutions. The Accidental Mind: How Brain Evolution Has Given Us Love, Memory, Dreams, and God, David J. Linden, The Belknap Press of Harvard University Press, Cambridge, Massachusetts, 2007. Don’t Believe Everything You Think: The 6 Basic Mistakes We Make in Thinking, Thomas Kida, Prometheus Books, Amherst, New York, 2006. Thanks Jeff. I’ll take a look. You are developping a very inspirational for me. Thanks for shraing. I will have to read the book as I “agreebut” with most of them. 1. Stories are a very efficient tool to retrieve information. But we all know that movies are not all good movies. 2. There, I must admit I agree. But the territory includes also asking questions to know more about a problem. recently I read, excuse me I don’t remmeber where, that we decide first and try to consciently confirm our decisions. 3.Chance and coincidence have to be perceived so my doubt is why do we perceive these special things that make us going a step further among other tings which wouldn’t be so useful Is there a non conscient filter which pick up these triggers ? 5. I agree. But it is a strategy to save energy to recall important thing. I came across your blog while studying for a information visualization mid-term exam. What a great resource! I am a school psychologist by day, so I’m curious to know how information visualization could be applied to educational data mining. As you probably know, the state of data management in the K-12 world is a couple of decades behind the business intelligence world. There probably aren’t many education-oriented info-viz folks out there. There actually are some folks out there who care a great deal about using infovis to analyze education-related data and then present what they find in compelling ways to others. I’m one of those folks. Last fall, I had conversations with a few others who share this interest at Infovis 2007. I would not only like to see education researchers become better equipped for the task with good infovis tools, but would also like to see the skills associated with data visualization taught in public schools. I teach such a course in the MBA program at U.C. Berkeley, but many of the basics could be learned by children during the latter years of elementary school. In time, I hope to help pull some of the folks who are interested in this together to create some momentum. In the meantime, I will cherish every opportunity that comes my way to provide services for educational organizations. Networking in regards to data visualization is definitely allowed on this site. The best place to do this is in the Discussion Forum, where you are welcome to ask questions, propose ideas, or even post some of your designs and ask for a critique. Concerns for education are very close to my heart. I’ll do what I can to help you with this work.